A group of Ilonggo doctors once dreamed of putting up a hospital in Iloilo—one that will have modern equipment to serve the growing population of Western Visayas. A feasibility study made five years ago showed that the underlying demographics were favorable, but the cost would be too high for the group to cough up. At the time, they needed P900 million to build a 150-bed facility. The group, led by Henry Tupas of Panay Medical Ventures Inc. (PMVI), started looking for a strategic investor. Tupas’ friend and classmate in medical school, Edwin Mercado, president of Mercado General Hospital Inc. (MGHI), took an interest in the project and signed a joint venture deal to put up the hospital in 2012. MGHI took in a 51-percent stake, while the local doctors led by Tupas kept an interest of 49 percent. Tupas then became president of PMVI. MGHI is the operator of University Physicians Medical Center, a private outpatient diagnostic and surgical facility at the University of the Philippines Manila-Philippine General Hospital (PGH) Faculty Medical Arts building. MGHI has been operating and managing the PGH facility since 2009, but its roots in the healthcare industry go half a century back through parent company Daniel O. Mercado Medical Center, operator of the 130-bed hospital set up by Mercado’s father in Tanauan City, Batangas. Since the trend in the hospital business around the world is to go “asset-light,” Mercado suggested that they instead look for a property developer that would lease land. That was about the same time Ayala Land Inc. (ALI) was breaking ground for a mixed-use estate, Atria Park, in the booming Mandurriao district of Iloilo City. ALI agreed to set aside a site originally intended for the business process outsourcing and took a step further by investing in MGHI itself. No longer just the landlord, ALI acquired an initial 33 percent stake in MGHI, which will increase to 40 percent through a fresh capital infusion of up to P450 million through 2016. The ALI-Mercado partnership is expected to invest P5 billion in developing a chain of 10 new hospitals and 10 mall-based satellite clinics by 2020 under a new brand called “QualiMed,” whose proposition is “alagang abot-kaya” (affordable healthcare). Catering to the needs of the broad C market, QualiMed commits to three As: Accessibility (ease of financial and physical access), Affordability (price predictability and competitiveness), and Appropriateness (quality service and genuine care). The pioneering ALI-Mercado partnership in MGHI is seen to be a win-win proposition. ALI provides strategic location and fuels rapid expansion of QualiMed which, in turn, completes the property developer’s lifestyle offering in its community developments. Furthermore, the partnership allows ALI to infuse into QualiMed the necessary technology backbone, procurement system, customer care and other best practices. The tandem is thus seen to allow MGHI to embrace a “disruptive” business model that translates to quality healthcare services at 30-40 percent lower than market rates. At the same time, it seeks to create an enabling environment for medical practitioners, thus helping to reverse the brain drain in this high-valued profession. On Oct. 17, a ribbon-cutting ceremony was held to mark the completion of QualiMed Iloilo, the first in a chain of hospitals under the Ayala-Mercado healthcare network. Earlier this year, two satellite Ayala mall-based clinics were opened—one in TriNoMA and another in Fairview Terraces. But QualiMed Iloilo is the first greenfield hospital project to rise under the Ayala-Mercado partnership. Starting November, the Iloilo hospital will initially operate with 40 beds, but with the construction of another floor, it will upgrade to 110 beds by next year. The new hospital will still have to undergo an inspection by the Department of Health at the end of the month before it becomes fully operational by the first week of November. The initial phase to open will be the women and children’s center. The next phase is the open ambulatory (outpatient or same-day surgery) services, which will come once the hospital secures its license. The facility was designed to focus on specialized healthcare services—built around a specialty “group practice” outpatient clinic model and complemented by a fully digital laboratory, advanced imaging services and an integrated computerized hospital information system. “When we started the feasibility study, we noted that the Iloilo healthcare industry is very conservative in attitude. I always make myself as an example. I’m an orthopedic surgeon with 20 years in practice, but there’s no special equipment to do minimally invasive surgery. Usually, the attitude of hospital operators is, they are not willing to invest in technology such as that. When we started this project, we promised that we will bring to Iloilo evidence-based technologies that doctors can use to facilitate not only their practice but provide healthcare services here,” Tupas said. Iloilo also provided a great backdrop to build the QualiMed hospital prototype in terms of skilled human resource. Outside of Metro Manila, it has the greatest concentration of board-certified and PGH-trained doctors. Iloilo Medical Society by itself has 1,500 members, of which about 1,000 actually live in Iloilo. It has a number of quality local medical schools. “In terms of medical specialty we have a lot. Unfortunately, they don’t have the necessary equipment to do what’s best for our population. So with QualiMed, we hope to answer that need,” said Tupas. How does QualiMed intend to offer services at prices 30-40 percent lower than the market? Mercado said part of the strategy is to adopt a streamlined organizational structure with a lot of shared services. For every unit, there’s centralized equipment and shared services in backroom functions like IT, marketing, human resources, procurement, business development. This is possible because the group is building hospitals from the ground up. The savings generated by the hospital allows it to charge lower fees. From as much as 40 percent of total manpower devoted to administrative and backroom functions, the ratio is seen easing to 25 percent. The “group practice” model adopted in Iloilo is also expected to be replicated in other upcoming QualiMed hospitals. “When they enter the group, unlike hospitals looking for doctors on a stock basis (for which doctors pay for), they (doctors) can buy into the group at lower cost of entry because they are not establishing a hospital but a clinic,” Tupas said. In effect, the hospital operator MGHI is like a shopping mall operator putting together these retailers under one roof except that, in this case, it brings together into one hospital doctors of different specializations. An environment of collaboration is thus created for these doctors to provide what is envisioned to be high-quality, coordinated and patient-centered care. Part of the goal is to offer a low-barrier gateway for doctors to practice and hopefully enlist young doctors, many of whom would otherwise be forced to stay as “hospitalist”—or glorified residents tending to other doctors’ patients—or seek employment overseas. In Manila, for instance, a new doctor typically has to pay P1.5 to P2 million to acquire shares of stocks in the hospital where he or she will practice. Aside from that, the doctor needs more money to pay for clinic space. When we started Panay (Medical Ventures), it was P200,000 (per participant) and it was even under a deferred payment scheme, Tupas said. From the hospital operator’s side, Mercado said there are two ways by which barriers to entry could be lowered. “Equity interest is purely a financial point of view. If the group wants to invest, fine, but we don’t require it for the group to practice,” Mercado said. In recruiting new members into the group, Mercado said the group has the autonomy to set the requirements. “Some may require a bit of equity, some may not, so it depends on the group,” Mercado said. He said some groups may want to adopt the model of SGV, a leading accounting/auditing firm in the country where, when newbies come in, work is contracted out to them, but each may rise to become a junior associate or senior associate. In PGHI, the Mercado group runs the Faculty Medical Arts building, which Mercado said is “proof of concept” that doctors can be organized in such group practices. Group practice has become prevalent in the United States when it shifted to an HMO-(health maintenance organization)/insurance-based reimbursement and payment scheme. Buy forming a collective, they gained more leverage in negotiating with such HMOs and other payors. By sharing space with other doctors of different specialties, Mercado said they have adopted a time-sharing system to optimize use of space. “Like in a particular area, you have five cubicles. You can have five doctors in the morning, five in the afternoon on a set of TTHS (Tuesdays, Thursdays and Saturdays) and a set of MWF (Mondays, Wednesdays and Fridays). You can have 20 doctors occupying a room with five cubicles, so there’s efficiency there. The cost now goes down because, instead of each having one secretary, you have two secretaries shared by 10 doctors,” he explained. To ensure high quality of service, the hospital operator has adopted certain benchmarks in patient safety. “Based on evidence-based medicine, we now adopt certain guidelines or algorithm of care. Since they are a group, we already input service level agreements in their contracts before they occupy space in QualiMed,” Mercado said. There is shared responsibility among the members of the group, but each is required to meet certain standards, like coming on time, adopting best behavior or not overcharging patients. “Apart from setting standards, cross-coverage is better. Intrareferral is better,” he said. But what serves as an incentive under such a collective practice? Mercado is cognizant that there’s a need to configure the compensation mechanism. The process is still evolving, he said. One possibility is to adopt one base pay structure and then compensate based on productivity on top of base pay and then adopt a performance-based system. For now, Mercado said, it may be too much for QualiMed to demand exclusivity among the doctors. “We’re hoping to give them enough group business so that they will stay with Qualimed,” he said. In the future, QualiMed may even shift to a model of having salaried physicians. “In the US, it’s going beyond group practice … Group practice now is being bought by the hospital,” Mercado said. Meanwhile, the opening of the Iloilo hospital this November is but a preview of Ayala-Mercado’s roadmap for QualiMed. Three more hospitals will be built in new locations in the next two years: North Point, Talisay City in Negros Occidental (third quarter of 2015); Altaraza, Bulacan (fourth quarter of 2015); and Nuvali, Laguna (first quarter of 2016). 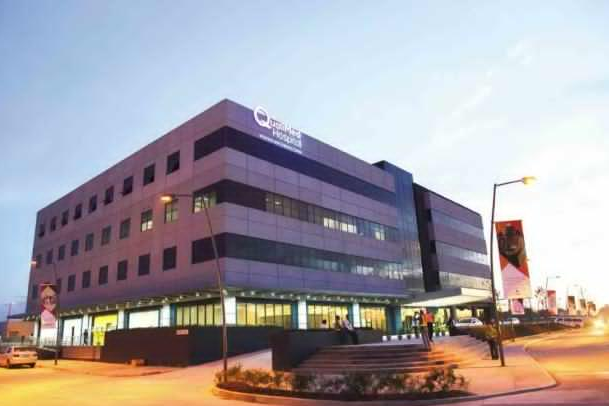 And to complete the network of 10 hospitals planned over a five-year period, QualiMed is set to break into six new markets: Alviera, Pampanga; Balintawak, Metro Manila; Arca South, Taguig; Cavite; Cebu and Davao.